Highly valued on Asian dinner tables. This article was originally published at The Conversation. The publication contributed the article to Live Science's Expert Voices: Op-Ed &amp; Insights. For many in the West, it might seem a marvel that slug-like sea cucumbers could be at risk of extinction from their popularity on dining tables. But to Asian consumers, this news should be no great surprise. A new study sheds light on why these humble sea creatures are at serious risk worldwide. Sea cucumbers are the less glamorous cousins of starfish and sea urchins, occurring in all of the major oceans and seas. Eaten in China and other southeast Asian countries for centuries, they are appreciated for their soft texture, dietary and medicinal properties. Dried tropical species can retail from anywhere between US$10 and US$600 per kilo in Hong Kong and mainland China. One cold-water species farmed in China and Japan sells for up to US$3,000 per kg dried. They are regarded as one of the “culinary delicacies” of Chinese cuisine and are often expected to feature on the menu of festive and formal dinners. With growing affluence in China, demand for sea cucumbers and other luxury seafood has surged in recent decades. Fishing pressure follows on from this demand. Recent research shows that sea cucumber fisheries have expanded into more than 70 countries and intense fishing in low-income countries has depleted many wild populations. A recent evaluation of all 377 species of Aspirochirotida sea cucumbers for inclusion on the IUCN Red List of Threatened Species placed 16 (some of which are the most commercially valuable) in threatened categories, corresponding to an elevated risk of extinction. Our study shows that high market value is the most influential factor in categorising sea cucumber species on the IUCN Red List as Vulnerable or Endangered. Species that are appreciated on the market and attract the highest prices are those first targeted by fishers. Subsequently, they are those that are most at risk. For some marine life, such as Bluefin Tuna and Sturgeon, increasing rarity makes them valuable and drives them towards extinction. But this is not true for sea cucumbers: their high value drives intense exploitation eventually making common species rare. The large geographic range of a species can contribute to over-exploitation and an increased risk of extinction as a result. 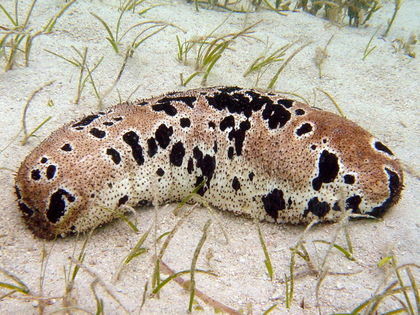 The reason is that widely distributed sea cucumbers have enough influence in Asian seafood markets to become well-known, making them high in demand. Rare sea cucumbers and those from isolated locations remain relatively unknown to Asian consumers and don’t exert enough influence on the market to become highly valued. Other important drivers of extinction for sea cucumbers are human population density and poor economies near to species. Wild populations that are overfished to critically low levels can be linked to poverty and this puts conservation in contention with peoples' livelihoods. Support from wealthier nations is needed for low-income countries to implement trade regulations and conservation measures. Based on a high proportion of threatened species, geographic hot-spots identified for conservation action included east Africa, the Coral Triangle in the southwest Pacific and Central-Western Pacific. The Asian seafood market accepts at least 60 species. When the higher-value sea cucumbers are wiped out from fishing grounds, fishers will probably shift to lower-value species. Coastal livelihoods are diminished as a result of lost income opportunities, which are relatively few in many island countries. But coastal fishers and wealthy Asian consumers aren’t the only ones to suffer from overfishing and local extinctions. Sea cucumbers play a significant role in the ecological system. They help turn over sand in reef lagoons and seagrass beds. By feeding on dead organic matter mixed with sand and mud, the nutrients they excrete can be again taken up by algae and corals – a pathway of nutrient recycling on reefs. Sea cucumbers have also been found to buffer reefs from ocean acidification. Feeding on reef sand by tropical sea cucumbers increases the alkalinity in surrounding seawater. This may help to protect corals and other reef organisms from ocean acidification. Our study underscores that a loss of sea cucumbers from overfishing poses a threat to tropical biodiversity and important ecosystem services to coral reefs already under global stress from changing ocean chemistry. Much of the research attention in marine conservation has been placed on “charismatic” fauna such as sharks and whales. The extinction risk of many sea cucumber species remains difficult to determine because of insufficient data. If we are to safeguard critical ecosystem functions and livelihoods for future generations, this disparity must be redressed with less charismatic fauna like the lowly sea cucumber. Steven Purcell receives funding from the Australian Centre for International Agricultural Research (ACIAR). Beth Polidoro does not work for, consult to, own shares in or receive funding from any company or organisation that would benefit from this article, and has no relevant affiliations. This article was originally published on The Conversation. Read the original article. The views expressed are those of the author and do not necessarily reflect the views of the publisher. This version of the article was originally published on Live Science.